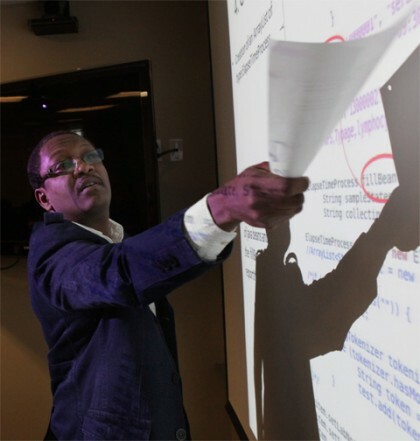 The weather has been rainy, and the midwinter days are short, but for two software developers from Côte D’Ivoire, four mid-winter weeks in Seattle offer a rare chance to develop skills under the close mentorship of University of Washington I-TECH experts. 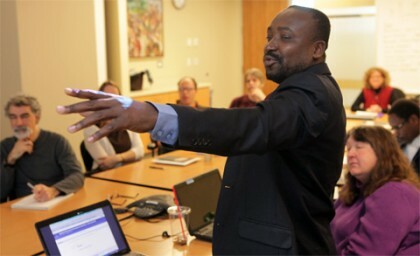 Dr Kone presents his capstone project to the Seattle OpenELIS team. “There is no opportunity in Côte D’Ivoire to build software development skills like this,” said Dr Constant Kone on a recent afternoon as the grey Seattle rain pelted against the window of his borrowed office at I-TECH. His colleague Mr Kamalan Fourier, typing intently on his laptop across the table they share, nodded in agreement. For several years, I-TECH has coordinated the implementation of the OpenELIS software in national public health laboratories in Côte D’Ivoire, an effort that is led by a highly skilled UW-based health informatics team. The open source laboratory informatics software was customized by the I-TECH team to match the workflow and local needs in Côte D’Ivoire. Mr Fourier presents his capstone project to the team. Like all I-TECH programs, the Côte D’Ivoire deployment of Open ELIS is on a trajectory towards local ownership and sustainability, but that path is made more complicated by the lack of skilled software developers in Côte D’Ivoire. I-TECH began recruiting for local software developers in April 2012, and recognizing that most applicants would require additional training, the team started designing a custom training course to build the Open ELIS development skills of the new hires in Côte D’Ivoire. As the first trainees, Dr Kone and Mr Fourier are in Seattle for four weeks, which is the intensive first phase of a planned nine month training program that will continue remotely after they return home. Central to the training is a problem-based curriculum developed by Antilla and her colleagues, which moves the learners through a typical software development cycle: gathering requirements, designing the solution, developing it into the Open ELIS codebase, and testing it before implementation. 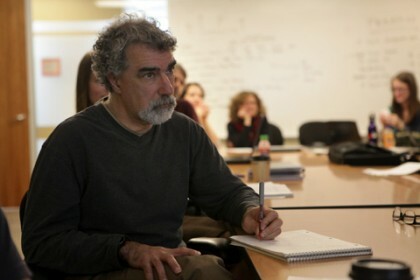 Paul Schwartz reviews the work presented by his Ivoirian colleagues, and provides feedback. In the next few months Open ELIS will be fully implemented at a new site in Côte D’Ivoire, the lab at the Institut Pasteur. For the first time there will be local developers on-site with the skills to solve problems locally for their colleagues, with ever-decreasing support from Seattle. And the I-TECH team in Seattle looks forward to having skilled colleagues at the point of deployment, sharing of the load.